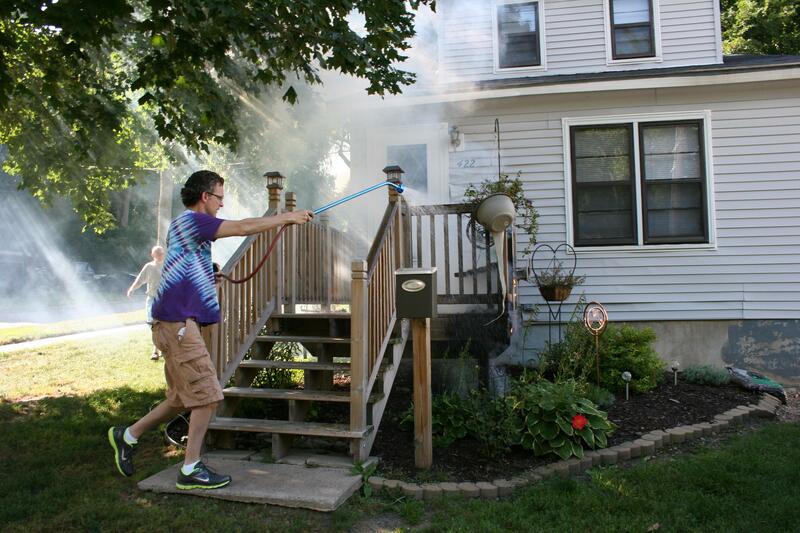 Ted Leon, initially known only as "Ted from Owatonna," extinguishes the fire on and under my neighbor's deck with water from a garden hose late Saturday afternoon. Ted was the first on the scene. I wanted to hear what professional Joel Hansen, whom I’ve personally known for years, thought of Ted’s actions. I was finally able to connect with Joel late Thursday morning; he had been off-duty for several days. “What he did was very heroic, very courageous,” Joel says. Ted ran onto the burning deck and banged on the front door to alert the Klocek family of the late Saturday afternoon fire before putting out the blaze himself. Kristin Klocek and her young daughter escaped through a side door into the garage. “He went way and above what a normal person would do. I’m encouraged to see someone who got that involved,” Joel says, emphasizing that dialing 911 to get the fire department en route should be the first course of action in any fire. Ted’s wife, Kathe, made that call. Joel praises Ted for stopping, getting that emergency call in via Kathe, focusing first on the safety of the residents, and then having the presence of mind to look for a garden hose to put out the fire. Ted, he says, seemed to be aware of his safety, to know what he was doing and to understand that he had options—like leaping over the deck railing—had that become necessary to escape the flames. In this photo you can see the scorched deck and how the heat of the fire melted the vinyl siding. If Ted hadn’t extinguished the fire when he did, there would have been “substantially more damage” to the deck and home exterior before firefighters arrived, Joel says. The Kloceks live about six blocks from the fire station, mere minutes away. 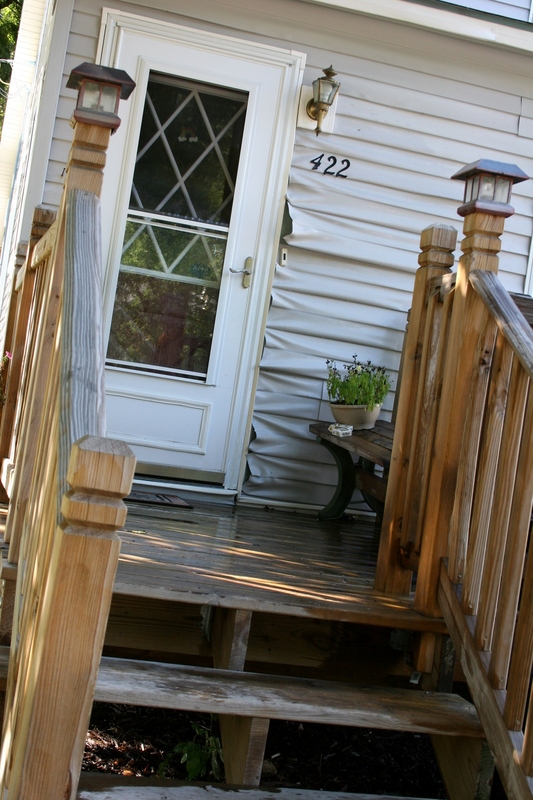 Damage to the home was limited to a partially-burned deck and wood chips underneath and to the front door and siding, which were warped due to the intense heat. Statistics show that a fire doubles in size every three minutes, according to Joel. I told Joel I was so focused on making sure my neighbors were safe and Ted was so focused on getting the blaze out (after he knew the family was aware of the fire) that we didn’t communicate. Joel wasn’t surprised. Then he asked if I looked for traffic before crossing Tower Place as I ran toward my neighbor’s home during the fire. I did. I distinctly remember telling myself to stop and look for cars. But I don’t recall hearing emergency sirens, although I watched two police cars and a fire truck race down Willow Street toward the scene. My husband assures me the sirens were blaring. In contrast, I remember sidestepping a pile of dog poop in the Kloceks’ yard and reminding myself to avoid that patch of grass. I was barefoot. I recall seeing a woman on her cell phone in the Kloceks’ side yard. I also recall a young man in the front yard, someone my husband later noted as a motorist who had pulled over in his truck and parked along Tower Place. FOR NIGHTS AFTER THE FIRE, I didn’t sleep well. The first night I was twice awakened by emergency sirens. We live along an ambulance route, an arterial street through town, and I’ve become so accustomed to sirens that I often sleep right through them. But not Saturday night. At 5:30 a.m . Sunday I awoke to the smell of smoke and flew out of bed to check if the fire at my neighbor’s house had rekindled. It hadn’t. Later I realized the smoke odor likely came from a smoldering campfire. For days afterward I felt emotionally-drained. Talking with Joel on Thursday proved cathartic. He understood how my emotional involvement—knowing the family—affected my reactions at the fire. He understood my lingering thoughts and emotions even days afterward. I shared with him that I have a new appreciation for how rapidly a fire can spread. Before Joel and I ended our conversation, I asked him about an award for Ted. He can’t speak publicly about that possibility, he says, because such an honor would be routed through the local union (not the fire department) and that involves a specific process. But you can read between the lines here. I fully expect Ted to be honored. And you can bet I’ll be there thanking him. Again. CLICK HERE to read a story on today’s The Northfield News website about a fire just outside Dundas that sounds all too-recently familiar. The Thursday morning fire also involved a passerby, a garden hose and a cigarette. CLICK HERE to read my first fire post.